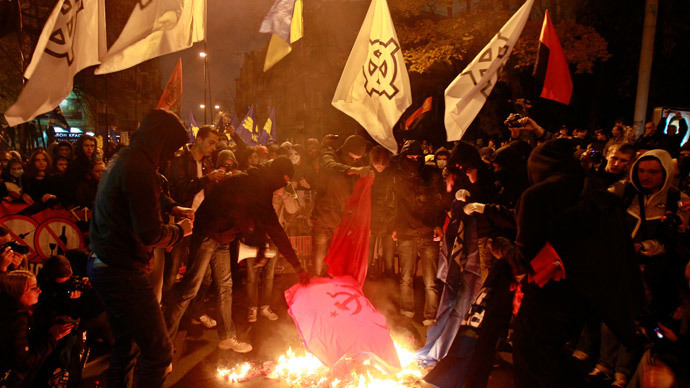 Ukrainian MPs have passed a law banning communist and national-socialist totalitarian regimes, and all their symbols. Another bill celebrates 20th-century nationalists accused of links to Nazi Germany, granting them social benefits. A new law equating communism to Nazism by banning both regimes was passed in the Ukrainian parliament, the Verkhovna Rada, on Thursday. Two hundred and fifty-four MPs voted in favor of the bill, with the required minimum being 226 votes. "The bill is directed at denunciation of communist and national-socialist (or Nazi) totalitarian regimes as being criminal under the law," an explanatory note said, also stating that "public denial of the criminal nature" of the regimes should be banned, as well as public use and propaganda of their symbols. According to the new law, all organizations, political parties or media accused of propaganda of communism or Nazism will be closed down. Supporters of the regimes must be investigated and information about them made public, so as "not to let such crimes happen in the future, and to eliminate the threat to Ukraine's sovereignty, territorial integrity and national security." The leader of Ukraine's Communist Party, Pyotr Simonenko, has criticized the Rada's decisions, saying that the law against communism aims to "dispose of the heroes of the Great Patriotic War [WWII]." "A war veteran is now banned to wear the Order of the Red Star, for which he has shed his blood. All this only leads to a greater split in the society and continuation of war," the MP said at a press conference, as cited by TASS. The Communist Party has been speaking against Ukraine's new authorities since the coup in February 2014, which saw President Viktor Yanukovich ousted. Shortly after Kiev launched a military operation against the southeastern regions, Simonenko labeled the campaign as a war against their own people. In June 2014, Justice Minister Pavel Petrenko announced a lawsuit to ban the Communist Party. In mid-summer, the party was dissolved by the Rada, with the official explanation for the move being an insufficient number of MPs in the party. Last week, Russian Foreign Ministry Special Representative for Human Rights Konstantin Dolgov said that equating communism with Nazism "is a highly cynical position," noting that it also contradicts international law, "including the results of Nuremberg." According to the leader of Ukraine's 'Petro Poroshenko Bloc,' the largest party in the Rada, the law does not ban communist ideology, as that would contradict the basics of any democratic state. "The bill bans a totalitarian regime, whatever colors it's painted in, be it communist or fascist. That's why we are not fighting the ideas, philosophers and scientists, but rather man-eaters who have tortured Ukraine," Yury Lutsenko told the parliament, as cited by RIA Novosti. At the same time, another law passed by 271 Rada MPs on Thursday officially recognizes Ukrainian nationalists who collaborated with Nazis in the 20th century as "freedom fighters". Members of several official, underground and paramilitary groups, including the Organization of Ukrainian Nationalists (OUN) and Ukrainian Insurgent Army (UPA), operated from 1917 till 1991. They fought "for the country's independence," and are now granted social benefits by the new law. According to the bill, actions by such organizations are now rendered lawful, as their goals and methods did not contradict the United Nations Charter, the Universal Declaration of Human Rights or other international acts. "The peoples of Russia have gone through extreme ordeals in fighting the Nazis. That’s why we find the policy of encouraging Nazism, extremism, stirring of hatred between the nations and escalation of military threats inappropriate," Russia's President Vladimir Putin said at the Kremlin on Thursday, at the ceremony of honoring Russian officers. "Such practices have caused a bloody drama in our neighboring Ukraine." The far-right OUN, which operated primarily in western Ukraine from the 1930s, used violence and terror against its perceived enemies as a means to achieve independence. The ultra-nationalists have been characterized as fascists by some historians, as their activities had a pronounced anti-Polish, anti-Soviet and anti-Semitic nature. The Ukrainian nationalist paramilitary UPA, which was behind the well-known ethnic cleansing operation against the Poles in Volhynia and Galicia in the 1940s, when up to 100,000 people were massacred, has now also been dubbed "freedom fighters" by Ukrainian parliament. One of its leaders, Stepan Bandera, was proclaimed a national hero by then-President Yushchenko in 2010 - a decree widely criticized by the European Parliament and later found to be unlawful. "Even partial justification of such phenomenon [justifying collaborators to the Nazis] is in reality an acknowledgement of the fact that any extremist and terrorist ideology is acceptable and can be implemented," the Federation of Jewish Communities of Russia (FJCR) claimed earlier this year. They condemned the authorities of Ukraine, Baltic nations and Moldova over their official line of support to persons and groups known for close cooperation with Nazi Germany and crimes against humanity during WWII.